The first Belt and Road Joint Conference was convened in Beijing today (June 12) by the Government of the Hong Kong Special Administrative Region (HKSAR) with the National Development and Reform Commission (NDRC), the Hong Kong and Macao Affairs Office of the State Council (HKMAO) as well as other relevant central ministries. The Joint Conference mechanism was agreed at the meeting, at which the strategy for promoting Hong Kong’s full participation in the Belt and Road Initiative and the work priorities for the year were also discussed. The Vice Chairman of the NDRC, Mr Ning Jizhe, attended today’s Joint Conference on the HKSAR Government’s account of and suggestions of participation in the Belt and Road Initiative. Other central ministries in attendance included the HKMAO, the Ministry of Foreign Affairs, the Ministry of Transport, the Ministry of Commerce, the People's Bank of China, the State-owned Assets Supervision and Administration Commission, and the China Banking and Insurance Regulatory Commission, etc. 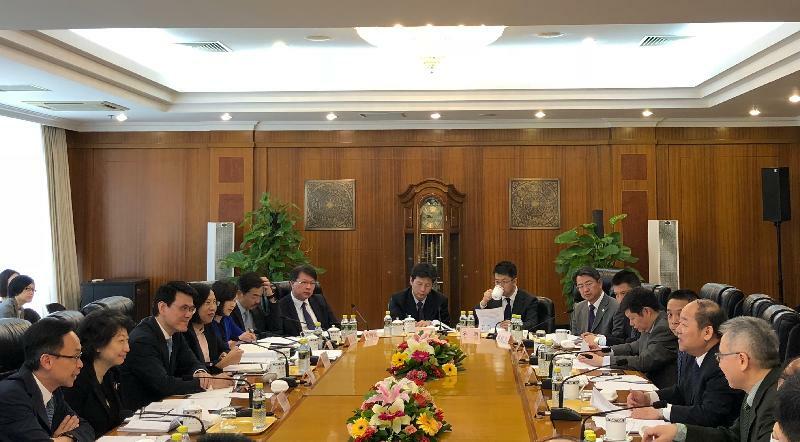 Relevant ministries noted at the meeting that co-operation with the HKSAR Government in the areas of finance and investment; legal and dispute resolution services; construction and works related services; project interfacing; and investment promotion would be deepened. The HKSAR Government officials attending today’s meeting were the Secretary for Justice, Ms Teresa Cheng, SC; the Secretary for Commerce and Economic Development, Mr Edward Yau; the Secretary for Constitutional and Mainland Affairs, Mr Patrick Nip; the Under Secretary for Financial Services and the Treasury, Mr Joseph Chan; and officials from the Development Bureau and Invest Hong Kong. Representatives of the Hong Kong Monetary Authority, the Insurance Authority and the Hong Kong Trade Development Council were also present. Ms Cheng said the HKSAR Government attached great importance to the Belt and Road development, and hoped that the relevant central ministries would support Hong Kong to provide international legal and dispute resolution services on Belt and Road. At the Joint Conference, relevant ministries also discussed how Hong Kong would develop green finance and insurance services related to the Belt and Road, and ways to encourage Mainland enterprises to use Hong Kong as the base to “go global”, as well as strengthen collaboration in project interfacing. Mr Yau pointed out that the Belt and Road Initiative was a key impetus in driving Hong Kong’s future social and economic development. The HKSAR Government would strive to take forward the Initiative, and would make the most of the Belt and Road Joint Conference mechanism to strengthen communication, collaboration and mutual support with the central authorities. As the key link for the Belt and Road, Hong Kong would leverage its advantages in meeting the country's needs. The establishment of the Joint Conference mechanism was set out in the Arrangement between the NDRC and the HKSAR Government for Advancing Hong Kong’s Full Participation in and Contribution to the Belt and Road Initiative signed by the HKSAR Government and the NDRC last December. At today’s meeting, it was agreed that the Joint Conference would be convened at least once a year as a platform for regular and direct communication.